"Such a light, crisp salad... especially on summer evenings! Everyone loves these noodle bowls and makes it a point to join us for dinner if they know they're being served. Increase or omit ingredients to suit your palate." Place noodles in a large bowl and cover with very hot water. Let stand until softened, about 15 minutes. Drain and chop into shorter lengths. Grind peanuts into a coarse, chunky meal using a food processor or mortar and pestle. 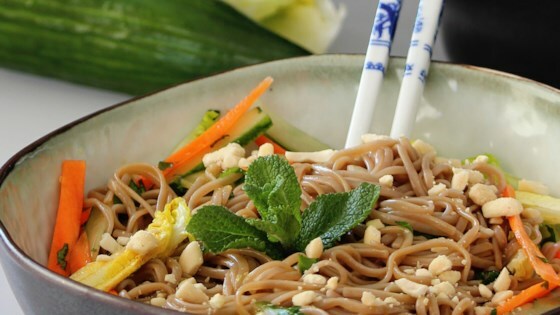 Combine noodles, peanuts, lettuce, cucumber, carrots, bean sprouts, cilantro, mint, and green onions in a large bowl. Serve soy sauce and wasabi paste alongside. Substitute 1 sweet potato for the carrots if desired. You can also serve the ingredients in separate bowls and let each person assemble his or her own noodle bowl. Though this is a traditional Vietnamese dish, I find it extremely difficult to get my hands on a good fish sauce. I've learned that, in a pinch, the soy and wasabi dressing is so much easier to keep on hand, and everyone loves it! I highly recommend each person combine the soy sauce and wasabi individually (sushi-style), as everyone has his/her own version of what proportion of wasabi they enjoy and can tolerate.